Coffee is said to have originated in Ethiopia. Today Ethiopian coffee ceremonies are common after large meals, even at restaurants. Women will roast beans in front of the guests. Then she’ll grind the beans, perfuming the room, and brew them in a clay coffee pot, or jebena. The coffee is served in small cups called si’ni. Diners have their choice of salt or sugar. Traditionally, every guest is offered 3 cupfuls- the same grounds being brewed each time, making each consecutive cup weaker. 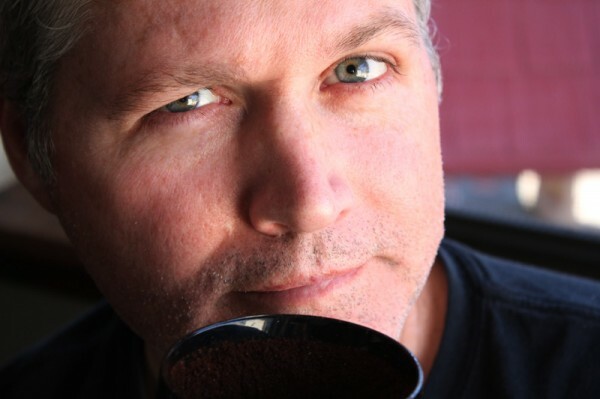 At best, I was ill-prepared to perform an Ethiopian coffee ceremony. #1, I live in Tulsa, Oklahoma. #2, I lack every single piece of traditional Ethiopian coffee-making equipment there could possibly be. In fact, the only proper element I have is a bag of green coffee beans. Tilda’s parents brought them all the way over from Ethiopia, known as the birthplace of coffee. At least the coffee was right. I got to work, putting my college nickname “MacGyver” to good use. What follows are the results of a free-spirited, improvisational coffee ceremony, done in the spirit, but perhaps not the likeness of a true Ethiopian coffee ceremony. I recommend you follow along in the spirit of discovery – no worries about equipment, make due with what you have. I promise you’ll have a blast. 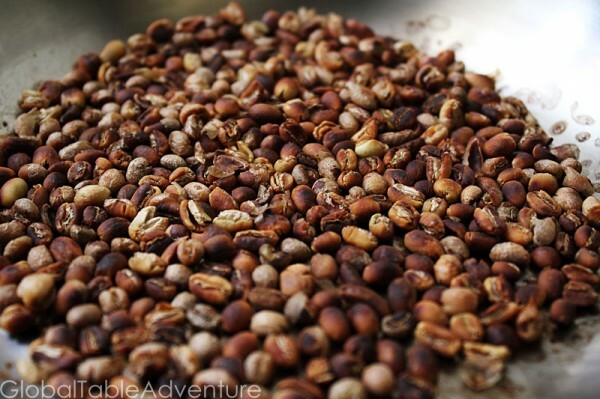 Before we get started, let’s watch an Ethiopian woman prepare coffee. 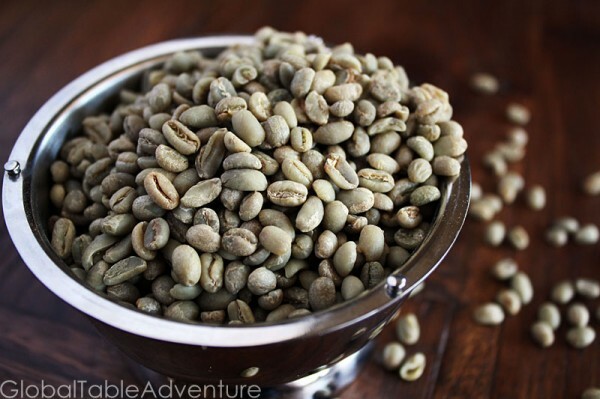 First, get your hands on some green coffee beans – a.k.a. 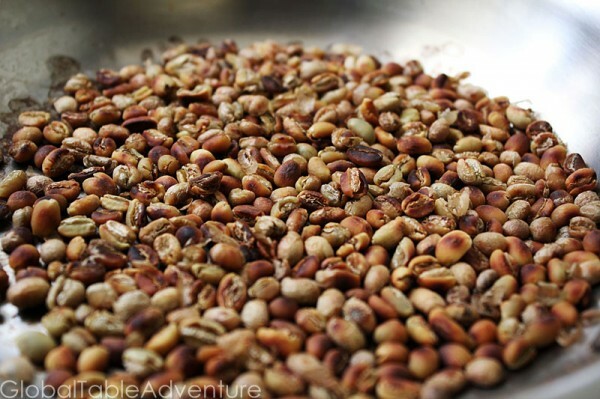 unroasted coffee beans. Try calling your favorite local coffee shops – they might have the hook up. 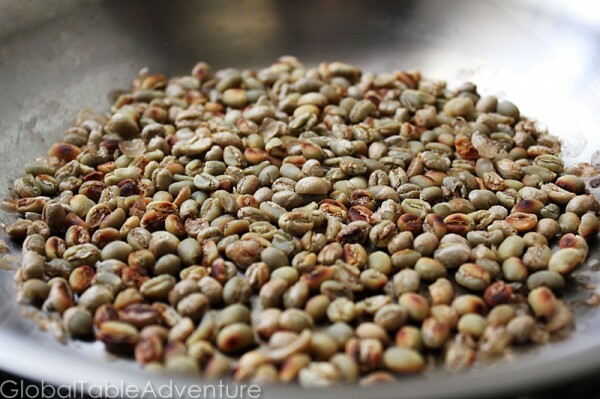 Green coffee beans smell remarkably like any other raw bean – rather grassy. Aren’t they stunning? 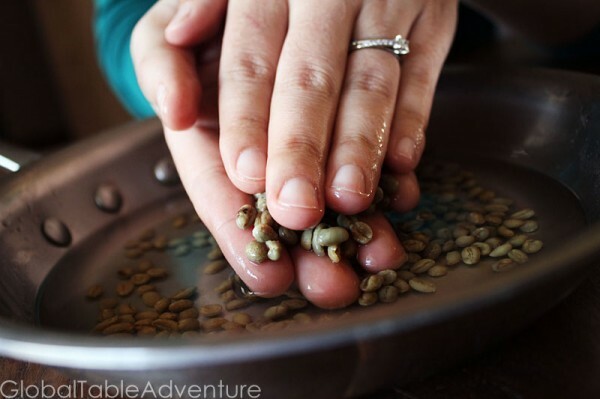 Next, wash the coffee beans in cool water. Pick through them like just like you would any other bean, removing any yucky looking specimens. They are very small. Pour off extra water and roast the beans in pan over medium/medium-low until popping and dark brown. Stir continuously with a wooden skewer or keep shaking the pan. Do not use a nonstick pan. Then the pan will dry out and the beans will start turning golden brown… keep stirring. growing more and more brown with each shake or stir. Eventually the beans start to take on a familiar dark brown color. About this time they’ll start to pop. Go as dark as you’d like – there is no wrong answer, only what you like. Mine were nice and dark – the photo makes them look black but they were more of a deep brown. Now, let’s get serious. Pass the beans around and deeply breathe in the aroma. Take the time to celebrate… ooh and ahh over the wonderful scent. Try not to burn your nose. Don’t worry, they do this in the authentic ceremonies too. The next step? Grind the beans. In urban parts of Ethiopia, restaurants now use coffee grinders, although traditional ceremonies continue to grind the beans by hand. Next, pass the coffee around again and breathe in deeply. Mr. Picky? To put it delicately, he wasn’t so sure. Then again, he hates coffee. I guess that just means more for me! Would you like a whiff? 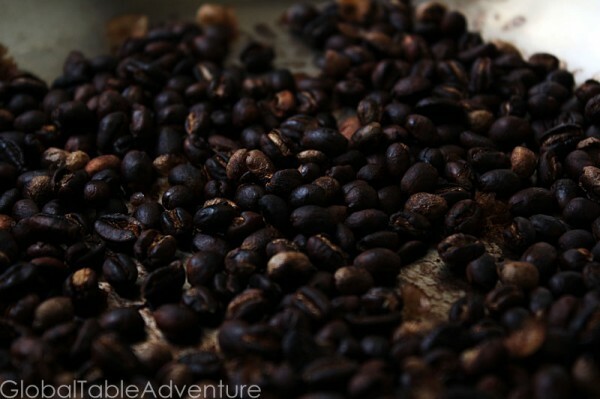 Full bodied coffee, freshly roasted. I’m pretty sure there’s nothing better. Next? In Ethiopia they use a jebena, or special clay coffee pot to brew the coffee. 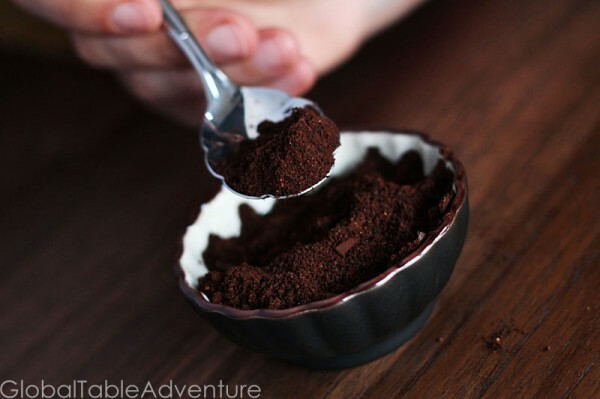 In a pinch, simply brew the coffee as you normally would. 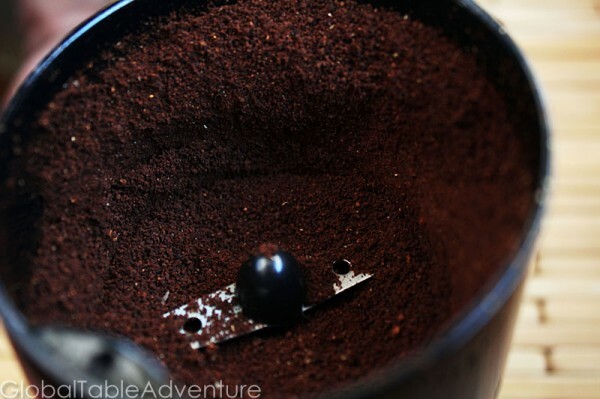 Some suggest that for every tablespoon of coffee grounds, you use 1 cup of water. I found this to be rather weak – not very suitable for Ethiopian coffee. Play around with works for you. Leave your recommendations in the comments. Also, when you go to pour the coffee, you should try and pour it from very high up – maybe 8-10 inches. This traditional method makes a beautiful stream of dark coffee into the mug. Getting the pour can take … ahem… practice. Use water. I’ll spare you those pictures. P.S. Be sure to serve in small cups with tons of sugar, a smile, and… oh, yes… popcorn. Tilda’s parents tell me when there is Ethiopian coffee, there is popcorn. Stay tuned. We’ll have that recipe up this weekend. 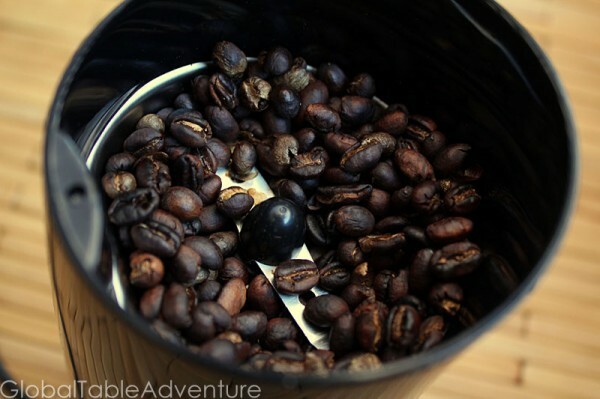 Wash the coffee beans in cool water. Pick through them like just like you would any other bean, removing any yucky looking specimens. They are very small. Pour off extra water and roast the beans in pan over medium/medium-low until popping and dark brown. Stir continuously with a wooden skewer or keep shaking the pan. Do not use a nonstick pan. At first the moisture will steam off…then the pan will dry out and the beans will start turning golden brown… keep stirring until dark brown and beginning to pop. Grind the beans. In urban parts of Ethiopia, restaurants now use coffee grinders, although traditional ceremonies continue to grind the beans by hand. Also, when you go to pour the coffee, you should try and pour it from very high up – maybe 8-10 inches. This traditional method makes a beautiful stream of dark coffee into the mug. 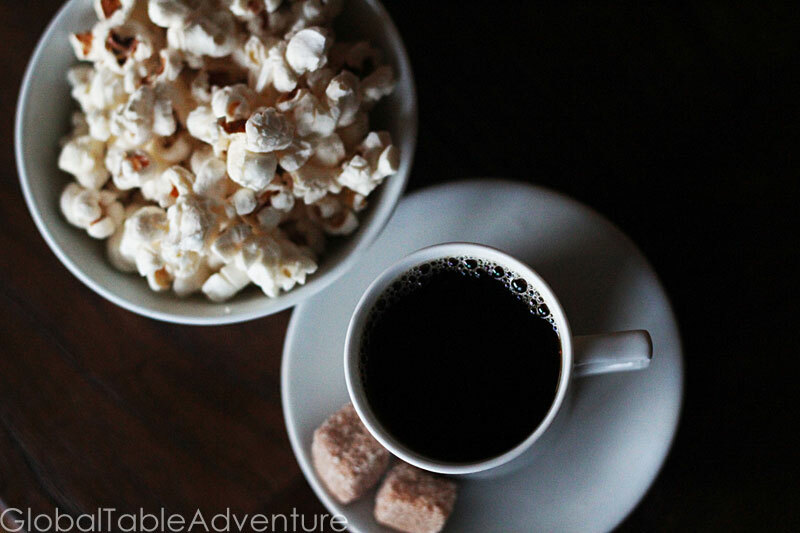 Be sure to serve in small cups with tons of sugar, a smile, and… oh, yes… popcorn. And don’t forget to burn incense during the ceremony! That too would be traditional. Ethiopians would have a clay incense burner with some coals and drop a few pieces of incense. In Addis Ababa’s main market (the Merkato) there is an entire street devoted to incense vendors — you can pick and choose frankensense (sp? ), resins, myrrh(?) and all sorts of goodies to make your own mix. It is way cool — but here a regular incense stick will do. And in traditional ceremonies guests would be encouraged to drink three cups. The pot would be refilled twice with the same grounds and three pots made (can you say jittery?). The orthodox Christian traditions are very embedded in all things Ethiopian so “3” is a common theme. Oh — and one should spread long bits of grass all over the floor around the coffee server. You are making me lonesome for Ethiopia! I wish Americans had a sign for “the evening is winding down”. When I’m a guest, I never know if I’m leaving too early or overstaying my welcome. The one or two times I’ve accidentally spilled a glass of wine usually wraps things up rather quickly 😉 Seriously though, America needs a code … the three cups is a nice one. Perhaps we can borrow it. Hello Sandra. I have a new Jebena pot. I was told there is something that needs to be done to the pot before use. I’m assuming it’s like ‘curing’ or ‘seasoning’. Do you know what is the process of this? YAY! I love coffee and popcorn. I plan to try this when I get a chance. My Mr. Picky will not drink coffee either. I think it would be fun to do next time we go camping and roast the beans over the cook fire. This is amazing! I would love to try this sometime myself!! Beautiful pictures! Thanks Carrie – you should – it would make for a fun evening or afternoon with friends. The kids could go crazy on the popcorn, and the adults can go crazy on caffeine! I found your blog through Rambling Spoon and am enjoying browsing your posts in this ambitious endeavor. I love it! I am an earnest traveler but with a limited budget, so I always love to bring other cultures to the table when I possible. 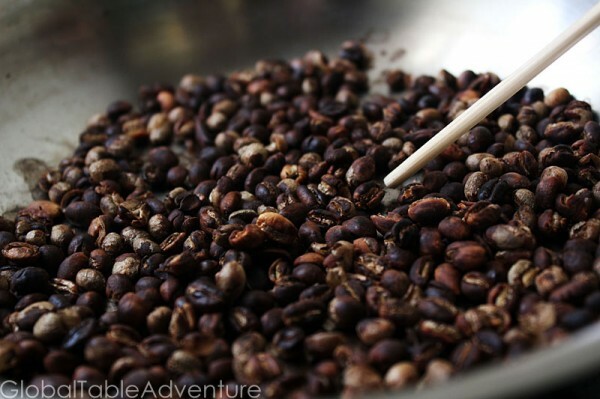 Thanks for the education on Ethiopian coffee ceremony…I do love a fine cup of coffee! 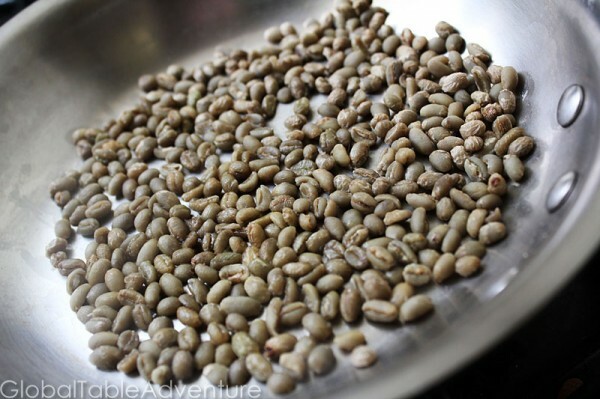 Green Coffee Beans Wiki Extract and is said to be the ideal diet for him/her. extract of green coffee beans wikis would seem to forestall the absorption of glucose sugar into the bloodstream. a standard of lifetime in many methods, strengthening the immune system. 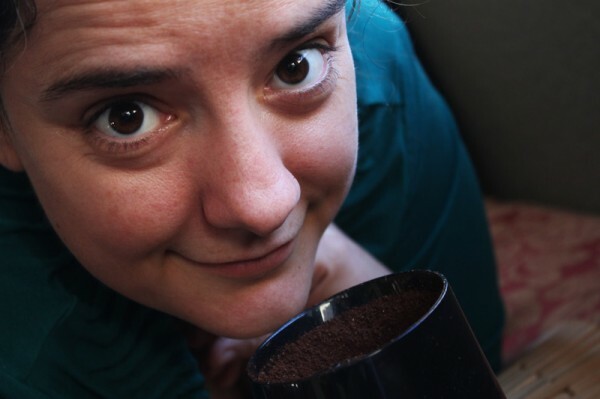 My teeny tiny Montana town has a shop where the owner roasts coffee which she distributes regionally and via a website (Cazbar). I can actually walk there and buy green beans to try this. I am excited to do so…..
Hello! Did you use a French press (a ‘Bodum’) in place of the jebena? I am doing the ceremony in a few days and am not going to go out and look for the jebena for one ceremony 🙂 Or did you use a drip machine? From what it looks like the coffee and water are in direct contact for brewing. Thank you! How do i prepare a brand new clay Jebena? I heard you need to ‘season’ it first before first use.